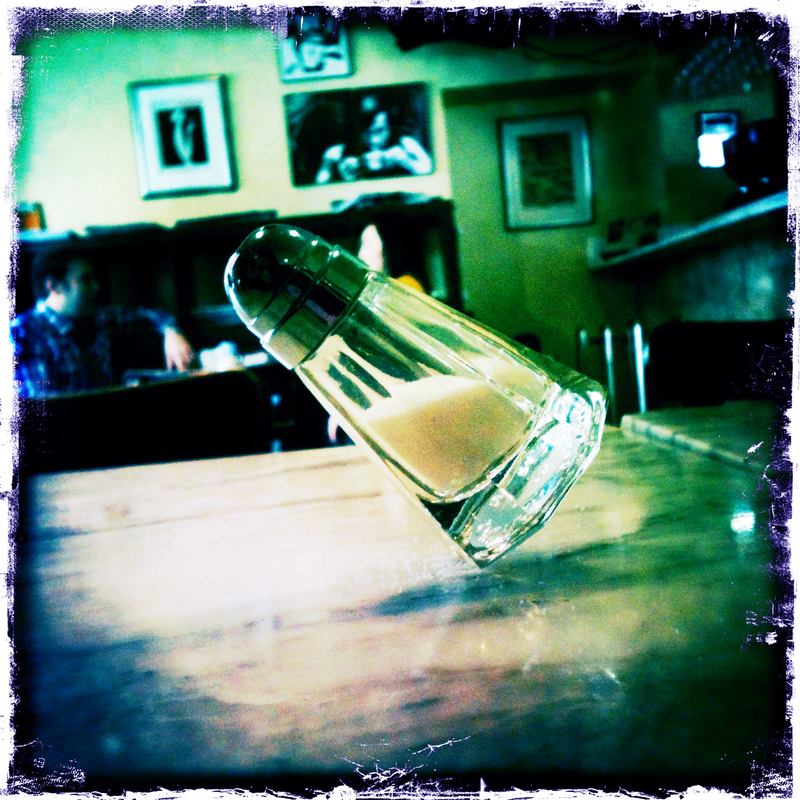 This is a trick my son does – balancing the salt shaker. I took this picture. Pretty cool, eh?! Sodium is a naturally occurring mineral. 90% of the sodium we consume comes from salt. We can’t live without it; it’s crucial for the natural processes of our body. The more sodium we consume the higher our blood pressure. High blood pressure = higher risk of heart attack, stroke and cardiovascular disease. Most people need about 500mg of sodium a day to maintain the right balance for their bodies to function properly. The American Heart Association recommends a maximum of 1,500mg a day. Yet in the U.S., the national average sodium consumption is 3,400mg a day! Over time this has serious health consequences. When we consume too much sodium, the body flushes away excess sodium in the urine. The kidneys regulate the level of fluid in the body, conserving water if the sodium level is low and flushing it out if the sodium level is high. The problem is if there’s way too much sodium (more than 1,500mg a day) for the kidneys to process, the body instead tries to dilute the sodium by retaining water. This excess water goes into the bloodstream. With increased blood volume the heart needs to work harder to circulate it. This results in higher blood pressure. Because high blood pressure usually has no symptoms it can go undetected until a serious condition is diagnosed. This is why it’s called the “Silent Killer”. To deliver oxygen and nutrients to the body’s cells, the heart pumps blood through the circulatory system. Blood pressure is the force of blood as it moves through this system. High blood pressure is when more pressure than usual is exerted on the artery walls. This damages the smooth lining of the arteries making it easier for cholesterol and fat to build up along its walls. Clogged arteries let less blood flow through so the heart must work harder. So where is this excess of sodium coming from? Have your blood pressure checked a minimum of every two years. Take note where your sodium is coming from and how much you’re consuming. Read the labels of all processed food you eat and add it up; you’ll be surprised. Also, you can be sure that restaurant food has high levels of sodium. Remember, the body only needs 500mg a day to a maximum of 1,500mg a day. Eat Less Salt: An Easy Action Plan For Finding and Reducing the Sodium Hidden in Your Diet by The American Heart Association. PS. After my pregnancy, I was having such a hard time losing the last 10 pounds. Then one day we ran out of salt in the house and I didn’t get around to getting some more right away. I first noticed my ankles became thinner, it’s like they had been swollen but I didn’t realize it, and then the weight just slid off. I didn’t make the connection at first but then realized it was the salt.